Friday, 6:23 pm, Vermont time. Saturday, 12:23 am, France time. Besides accompanying Silvio and Lily to the Matisse and Chagall Museums, Flat Stanley has been to the beach and the Promenade des Anglais (The English Walkway), a celebrated promenade along the Mediterranean, in Nice. Prior to urbanization, the coast at Nice was bordered by a band of beach. The first residences were erected on higher ground and away from the sea. Around mid 18th century, the English frequently wintered in Nice due to the exceptional panorama offered by the sea. However, upon noticing the increase in the beggar population following a harsh winter, the wealthy English who had residences near the coast proposed hiring them to construct a walkway (promenade, in French) along the sea. Little did they know that some day a little cardboard guy with a very English name, Flat Stanley, would cross the great Atlantic Ocean for a bit of sight-seeing from La Promenade. Silvio should return home with many photographs, but it appears he is not able to share them from his current location. We should look forward to a great “Show & Tell” when he returns. 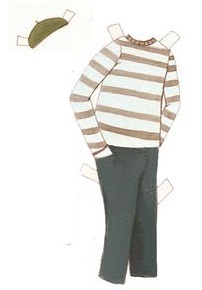 Meanwhile, I think we should recommend a proper attire for Flat Stanley’s walks on La Promenade des Anglais. What say you to this outfit à la Marcel Marceau?